Cancer emerged as one of the killer diseases of the century. The treatments prevalent today can cure the disease but the pain associated with cancer and treatment becomes unbearable to patients. 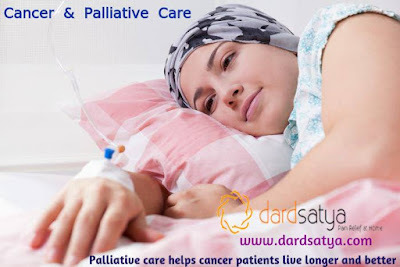 Dard Satya provides best Palliative Care for Cancer in Bhopal. 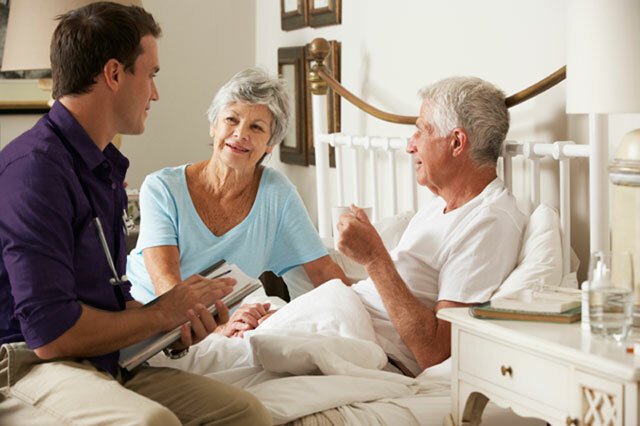 Palliative Care is the medical care provided by a team of physicians, nurses, physiotherapists, and other health workers to provide patients solace from the symptoms, pain, the mental stress of any serious diseases. Palliative care for cancer will start at the beginning of treatment and continues to complete cure. Dard Satya provides palliative cancer care in Bhopal and other cities like Noida, Delhi, Bangalore. Nursing care is very much essential for patients who are suffering from long lasting diseases or serious life threatening diseases. It will be very comfortable for patients, if the nursing care is given at their home itself. This will provide easy access to friends, family members and colleagues. Thus, makes the patient relaxed and feel secured. Nursing care at home will make all the difference in patient's health irrespective of all illness and injuries. 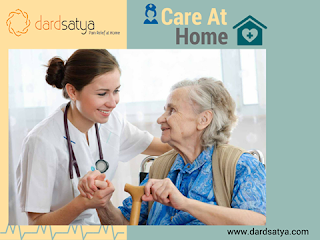 Dard satya is a pioneer in providing nursing care at home. In addition, it provides the best palliative care services in Delhi. In addition to this, it also provides ventilator care at home, pain management interventions, bed sore care at home, bereavement care, psychosocial support, physiotherapy etc. Dard satya provides the best home care and nursing care services across India. The team comprises experienced palliative care doctors and nurses who is capable of providing best palliative health care in Delhi. Our main aim is to reduce the pain and suffering of patients affected with chronic diseases. Cancer is the abnormal growth of cells which results in damage of tissues. In some cases the cell growth lead to tumor. There are different types of cancers affecting various organs and damaging various body parts. Cancer pain is caused by the pressing of tumors on to the bones, muscles, nerves or other body organs. Cancer treatment is provided to the patients in a wide range, but cancer pain treatment is not given much importance. It is time to rethink. Give relief from pain to our near and dear ones, Dardsatya is here to help you. Cancer pain are of different types, based on the cause and type of pain treatment also varies. Nerve pain: It is caused due to the presence of excess pressure on nerves. Bone pain: Here cancer spreads into bone and damage bone tissues causing bone pain. Soft tissue pain: It is the pain caused from body organ or muscle. Phantom pain: Here pain is felt on the removed part of body. The main aim of Palliative Care is to make patient comfortable during the entire course of the treatment. It gives relief to patients, control the side effects and will improves the lifetime of patient. Yoga, meditation and other exercises are also provided. Dardsatya provides the highest level of ease and relief that can be given at home, here we provide the service of experienced doctors which help the patient in reducing pain and stress. The team of dardsatya provides and promotes Pain and Palliative care to improve the quality of life of patients suffering from chronic diseases at home. Labels: bone pain, nerve pain, Palliative Cancer Treatments, phantom pain, soft tissue pain. Dementia is a physical condition that describes a set of symptoms like memory loss, difficulty in speaking, thinking and problem solving. The disease reduces a person's ability to do his routine activities. Dementia is mainly caused when the brain cells are damaged by any diseases or by a series of stroke. People suffering with dementia need more care and attention compared with other people. Palliative care centers offers extra care and attention to these types of people. Patients can feel a homely atmosphere. Palliative care center is special medical care center for people suffering with serious illness. They aims on providing relief from serious illness and thereby improve the quality of life for both the patient and his family. The care is provided by specially trained doctors, nurses and social workers. The care is provided to the people of all ages and at any stage of illness. Dardsatya a Palliative Care Center in Delhi offers pain and palliative care services to patients who are suffering from serious illness at their home itself. We offer Palliative Care for Dementia in Delhi. Services such as pain management at home, guidance for medical treatment, emotional support and counseling are offered to our patients. We offer world class treatments and services for our patients based on Right Diagnosis, Right Approach and Right Intervention. We focuses to provide international standard care and services to our patients and give counseling and guidelines for the caregivers. Palliative care is a class of health care for patients and families who are struggling life threatening illness. Palliative care also known as end-of-life or comfort care. It mainly focuses on patient’s psychological, social, cultural, emotional and spiritual needs. The goal of palliative care is to provide comfort and dignity for the person living with illness as well as his / her family and their objective is relief of pain and other troubling symptoms. Pain Management Treatment in India is vastly increased day by day. Palliative care can be provided anywhere. Many palliative care programs provide services and support for patients where they are living includes at home, in a residential hospice, in hospital or in personal care home. The best place to receive care is the place that best matches your needs. Dardsatya a Palliative Home Care In Delhi , provides pain and palliative care services to patients at their home. Our services include Pain management treatment at home, symptom control, and guidance for medical treatment, emotional support and counseling. Our palliative care team consists of palliative care physician, pain management team, psychologist, social worker and primary care physicians to make the patient’s life enjoyable. We assure a healthy relationship with doctor and patient. The patient can able to contact with his/her doctors directly in emergency cases and it will help them to boost their confidence. We give proper awareness and guidelines about the diseases and their treatment procedures. Feeling breathless without making any special effort, it's not normal. There may be several causes for this symptom, with a cardiovascular problem. The sign of what? - In heart failure. The shortness is the first sign of this condition. It starts with difficulty breathing then it is a real shortness of breath on exertion which finally manifested worsens at rest. How to define shortness of breath? Shortness of breath is a familiar sensation normal after an intense effort. This is an increase in respiratory rate which enables the body to increase the intake of oxygen. The breath becomes problematic when it occurs after minimal effort or even without effort, it s' it worsens or is accompanied by other symptoms such as chest pain or leg edema, for example. Shortness of breath may be related to various diseases, in particular cardiac, respiratory (lung), metabolic diseases (such as obesity) and even psychological (anxiety, anxiety attacks). Most causes of breathlessness however concern disorders of the lungs or heart. If unusual shortness of breath, the doctor will perform a complete examination, listening to the heart and lungs, to the study of history and, if necessary, additional examinations. respiratory diseases: asthma, pneumonia, chronic obstructive pulmonary disease (COPD), pneumonia, idiopathic pulmonary fibrosis, cystic fibrosis (CF), tuberculosis, etc. If shortness of breath occurs abruptly and it is important, it is better to call the emergency because it can be a heart attack or pulmonary embolism. If shortness of breath is chronic, a complete medical evaluation will identify the cause. What are the solutions in case of shortness of breath? Most often, chronic shortness of breath due to respiratory or cardiac disease. In case of respiratory infection, appropriate treatment (antibiotics) will be prescribed. If shortness of breath is related to an asthma attack, the salbutamol inhaled (Ventolin) may relieve symptoms. More potent drugs may also be administered in the hospital. In case of cardiac disease, appropriate management will limit the symptoms, to the extent possible. We provide comprehensive care for patients with the help of portable ventilator and oxygen support at home for regulating/ managing the respiratory disorders. 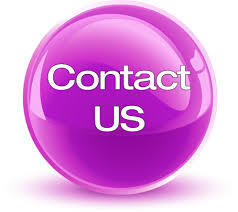 We are creating your hospital feasibility in your home and live with better Health. Cancer is an unusual cell growth or spreading cell growth in different parts of our body. Although any medical skilled peoples can offer palliative care by addressing the facet effects and emotional problems with cancer, some have a specific specialize in this kind of care. A palliative care specialist treating the symptoms, side effects, and emotional issues experienced by patients. The goal is to keep up the most effective potential quality of life. How Palliative Care Help Cancer Patients? The main aim of palliative care is to help those people, who are suffering from cancer like chronic disease. Palliative care is given the whole time care for a cancer patient. It should begin with analysis and maintain through follow-up care, various treatments options and the end of life. Most of the patients like to live there remaining life in their own home, a solution is available at Dardsatya pain and palliative care service. ”We Bring Hospital To Home “. Dardsatya an organization provides pain and palliative care services at patient’s home.